Mangaluru, Aug 22, 2017 : As the bard of Stratford on Avon said "What’s in a name? That which we call a rose by any other name would smell as sweet." - ! The same cannot be said about Midbrain activation because the scam has entered our district with another name which smells as bad! While all experts in psychology, psychiatry and education are in agreement over that there are no methods to increase the intelligence or memory but only methods to make efficient use of them a myriad of quacks peddle their dubious wares promising parents that their progeny are the most brilliant but hitherto unrecognised geniuses on terra firma! All that is needed to bring out this latent talent is the right stimulus which who but the Efficient Brainy academy can provide! So in other words for a set fee each and every child can be made into genius!To develop confidence they claim affiliation to International Brain Research Organisation, a body unheard of in academic circles and Society for Neurosciences as if these are some statutory bodies! Despite of all the claims of enhancing the faculties and abilities the only tangible item to convince the parents and the public is their usual stunt of blind folded ‘seeing’! The blind folds with padding are tied and the child sees through them and this should convince even the most cold hearted and tight fisted parent that the genius of his/her progeny has been unleashed and the offspring can rise to the top of the world! Their blurb too promises that –that we can do anything blindfolded seems to be the catchy slogan for the world! 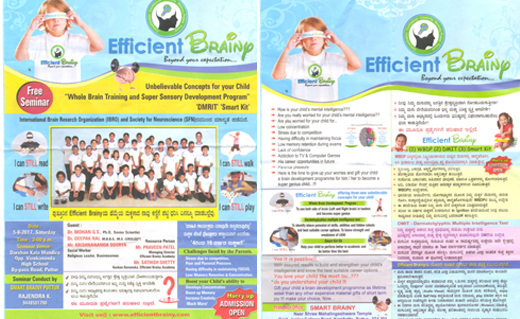 The previous avatar of the same scam going by the name of Midbrain activation had been exposed by us more than two years back and now has sprung up with a new name! But, the activities that happen under this ‘training’ are cloaked in mystery . The children (mind you this is only for them) are taken into premises which are out of bounds to parents, elders or any one else for that matter! Again, if you think that this activity springs from a desire for social service you are wrong again! One has to pay a stiff fee of a cool ten thousand rupees to make his/her child ‘brainy’! Well how does this work? Can one see with the eyes blind folded? That seems to be big mystery to all except us who have exposed their modus operandi long back. This video which has been seen by lakhs of people shows how we exposed it two and a half years ago at Kozhikode. The scam industry which took a death blow then is yet to recover in Kerala! We are always asked questions as to how the children can see through the blind fold. The fact is that they cannot. But, they are so much brain washed by those who run these scams that they are led to believe that they are seeing through the blind fold while they are actually peeking through the gaps! They are also threatened that they will turn blind if they reveal the secret or that it is a well kept secret like the tricks of the magicians and should not be revealed. On boy whom I had exposed two years back agreed that he was lying but it was out of consideration for his parents who had spent 60k on taking him and his younger brother all the way to Mumbai to get their ’midbrain activation’ done! We are told that after the ‘grand inauguration at Puttur’ with a few guests the scamsters intend to take it all over the district. We caution parents and educational institutions not to fall for this scam. By the way we are ready to test the claims of ‘ blind folded seeing’ at any time with methods of blocking light which we see fit and objects to be identified which we provide to the degree of specificity we shall define to check the abilities to see without light falling on the retina under fool proof conditions. As for their magnum opus of training children to see blind folded we can do it free of charge for any child in a few minutes with the permission of the parents or for any adult who has good eye sight without glasses. We request the department of public instructions, the CWC, the district administration to be watchful of such scams which may cause permanent damage to the psyche of impressionable children.